The keynote speaker at Family History and DNA: Genetic Genealogy in 2014 will be Dr. Maurice Gleeson, a popular speaker and the organizer of Genetic Genealogy Ireland 2013, Ireland’s first conference on genetic genealogy. 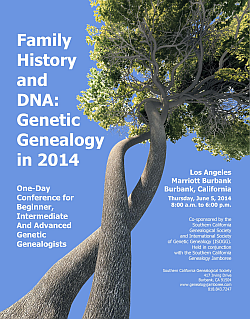 I had the opportunity to speak with Dr. Gleeson at last year’s event (including about his interesting iCARA project), and he’s both engaging and extremely active in the genetic genealogy field. I have no doubt his presentations and keynote will be fascinating. I will again be presenting at DNA Day, a lecture entitled “Using Autosomal DNA to Explore Your Ancestry,” sort of the basics of using Autosomal DNA. I’m not crazy about the 2:15 time spot, however, as I’ll be competing with Judy Russell, CeCe Moore, and Bennett Greenspan! A Terrific Line-Up of Speakers! Here’s the full line-up of speakers for the 45th Jamboree, and it’s quite a list! I hope to see you there! I wish I could be there to hear you speak! Of course, I am planning on being in southern California later that week for another activity. There are specific breeds llower susceptible to chocolate howeveer never give your dog chocolate by choice. but which points you in the right direction. great split, during hich time modern genetic featgures developed independently.